The building of old London Bridge was completed in 1209. Yesterday the current London Bridge was closed to traffic to hold the 8ooth anniversary fayre. Part of the festivities included a sheep drive. 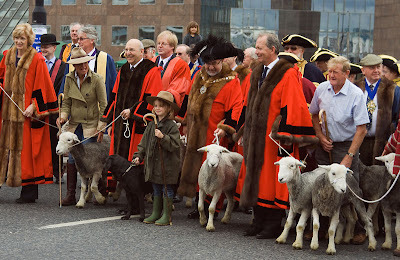 The origins go back to medieval times when the freemen were permitted to drive their sheep across the bridge bringing them into market without having to pay the toll. Oh how brilliant! Super photo, Mo and love the history. Sheep are the topic du jour. Reading your blog is like going to an art-history museum. I love it Mo! That's a great and old tradition! Ah, so that was what was going on. Spent ages on a diverted bus. Seems worth it now! Love London. What a lovely tradition to keep! Love those red coats with fur trim, though I hope the fur's synthetic. I was part of the sheep-driving yesterday... rather wet! Check out my blog for my view of the day. Great sheep shot! Baaaah! The orange robes are fancy! Baaah - baaah! Our oldest suburban bridge in town is from the 1960s - you're lucky! Baaaah! What a fun shot, I love the costumes! Great shot and interesting information. There is a very odd connection between London and Arizona in that we have the original London Bridge, take down and reconstructed in a place called Lake Havasu. I always thought it was such an odd thing to put up in Arizona. There is absolutely now resemblance between the vast desert surrounding Lake Havasu and the lovely green that surrounds London. Lake Havasu City was founded by Robert McCulloch of the McCulloch Chainsaw business and he purchased the bridge in 1968 for 2.5 million dollars to become the focal point for his planned community. They do have festivals there from time to time but I don't think they driven any sheep across it! It's mostly tourists. Anyway, thanks for sharing lots of interesting photos and info. This is a great blog - I lived in London for 12 years - still miss its vibrancy. Thanks for popping by mine and leaving such a nice comment. I'll be back here. Beautiful, colorful photo and very interesting tradition! Good one - love the little shepherd in the front. Mo & all those who live in London & I suppose elsewhere, is anyone going to attend the great BIG cup cake hand out? Love some photos of that! This kind of things can only happen in London! Marvellous! Ciao. A.